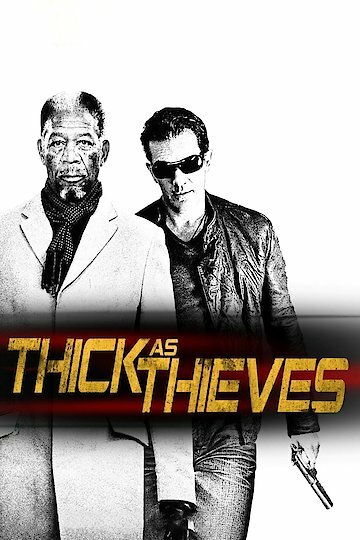 The Code which is also known as Thick as Thieves was originally released in the Spring of 2008. The movie stars Antonio Banderas as Gabriel, Morgan Freeman as Ripley and Radha Mitchell. The Code was directed by Mimi Leder and produced by Les Weldon. Mini Leder also wrote several segments of this film. The movie is about an experienced thief swindler named Ripley played by Morgan Freeman. Ripley is hugely in debt to a Russian mobster. Ripley engages a well experienced thief played by Antonio Banderas to pull off a huge heist. The purpose of pulling off the huge heist is to repay a large debt to the Russian mob. The heist is carefully planned and everything seems to be going according to the original plan. Gabriel played by Antonio Banderas becomes romantically involved with a real beauty played by Radha Mitchell. Once the romance blossoms and becomes serious it threatens the whole heist. In addition, the new romance threatens to come between Gabriel and his original partner in crime. Gabriel must make the decision about weather the heist is his real priority. It seems once love enters the picture Gabriel seems to lose his interest in continuing his life of dishonesty and crime. Finally, repaying the original debt to the Russian mob must still be done. However, repaying the debt to the mob will take longer and become much harder than expected since love has blossomed. Once the debt is taken care of Gabriel decides that maybe crime does not pay. Gabriel starts to convince himself that maybe love is much more important that any involvement with the Russian mob. The Code (aka Thick as Thieves) may be purchased on DVD at a discounted rate through the Internet. In addition, the movie may also be purchased at almost any retail store. The Code is currently available to watch free on Tubi TV and stream, download, buy on demand at Amazon Prime, Google Play, YouTube VOD online.